HABIB UNIVERSITY, April 07, 2016: Habib University’s School of Science & Engineering (SSE) has scaled up its efforts to build constructive dialogue with the broader public on issues of common concern this semester. In the past month alone, it has invited academics and industry professionals to address topics as diverse as Information Security, Gravitational Waves, Social Development and Computer Graphics. The SSE’s latest public event, titled “The War Against Cancer: Can We Win?”, complemented the School’s aforementioned efforts in public engagement. Delivered by Dr. Kulsoom Ghias, faculty in the Department of Biological and Biomedical Sciences at the Aga Khan University Medical College in Karachi, the lecture was a highly informative session for those who want to understand and know more about one of the most feared diseases in human history. Structuring her talk as a history of human understanding of the disease, Dr. Ghias took the audience through the why, what and how of cancer. 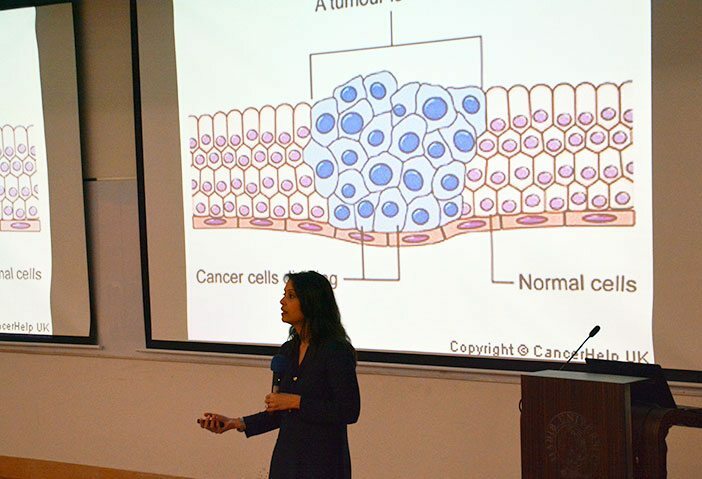 Dr. Ghias usually teaches undergraduate and graduate students of medicine at one of Pakistan’s most esteemed medical schools, yet, to her credit, her talk was as intellectually accessible to a social sciences major as to a cancerologist. Breaking down the basics of cancerology, Dr. Ghias started her lecture by describing the building blocks of human life – our DNA (or DeoxyriboNucleicAcid). Within a few slides, she explained how DNA molecules, constantly communicating with each other from inside trillions of cells, sustain all biological systems. Cancer, she explained, happens when this system stops working and communicating the way it is supposed to – i.e., a mutation in some cells causes them to start behaving abnormally and ‘rebel’ against the rest of the system. Having established the fundamentals, she then described the history of cancer studies and the developments and advancements in the so-called ‘war’ against cancer, initiated by US President Richard Nixon in 1971. She was quite candid in stating that the work is far from done; that a concerted effort is required from researchers and professionals from across different fields – including communications, engineering, medicine and so on – if serious advances are to be made. Using literary references and quotes from prominent individuals in history, Dr. Ghias guided the audience through the themes of her presentation. For example, an excerpt from Dante’s Inferno (“Do not be afraid; our fate//Cannot be taken from us; it is a gift.”) introduced the prevalence of cancer worldwide and its history. A line from Mary Doria Russell’s novel A Thread of Grace (“No matter how dark the tapestry God weaves for us, there’s always a thread of grace.”) provided some reason for optimism after a particularly bleak assessment of how difficult it is to understand and cure cancer; while a quote from Sun Tzu (“Know thy self, know thy enemy. A thousand battles, a thousand victories.”) preceded a discussion of the future of cancer research. Dr. Ghias opened the floor for questions after concluding her talk, and many in the audience used this as an opportunity to benefit from her insights into the disease as a cancer researcher. The questions were candid, and Dr. Ghias’s engagement with the audience in an open, accessible manner helped remove some commonly held misconceptions about the disease.